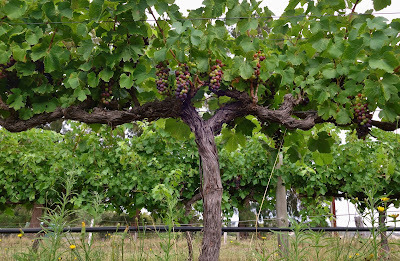 Yangarra's Ironheart Vineyard Shiraz, which grows just across my front fence, is well into veraison, or colouring, and looking very healthy, in spite of the warm, wet and humid summer. These biodynamic/organic vines have been hand-plucked three times this season to remove extraneous leaf so the bunches get dappled light and plenty of breeze. Note, too, how all shoots have been removed from below the cordon (the horizontal woody trunk) to admit maximum air movement. This breeze dries the bunches and bark during humid spells, so reducing the requirement for fungicide spray. Should any bio-d/organic fungicidal application be required, the exposure of these grapes will ensure the spray is efficiently spread and absorbed. 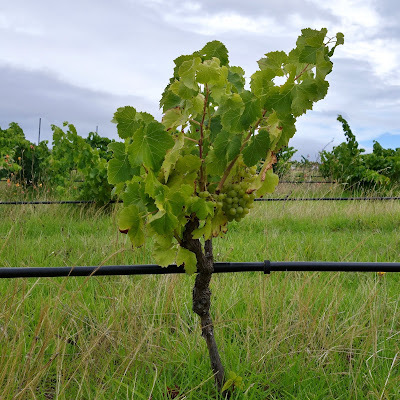 There are many vineyards through the Ranges this vintage with such aggressive, uncontrolled foliage that should mildews or botrytis strike and spray is suddenly needed, the droplets will likely be wasted in the leaves and not even penetrate the crown to reach the grape skins. 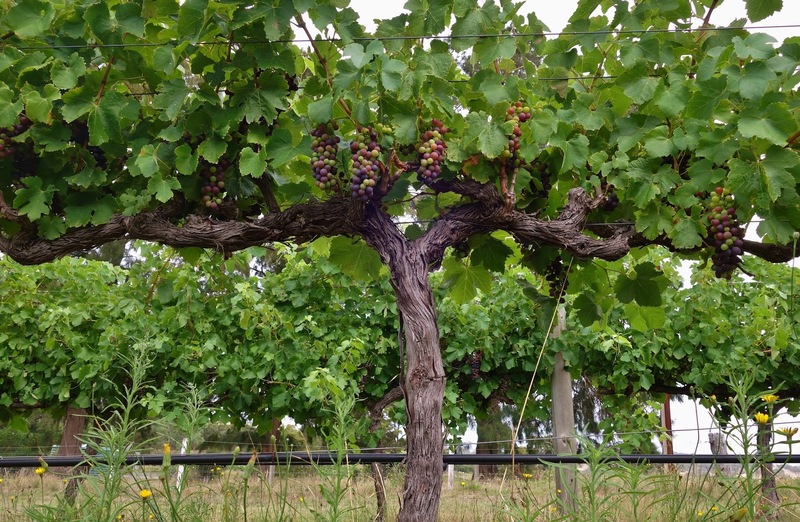 On the other hand, this baby bush Grenache vine (below) in the adjacent block is well short of any colouring. 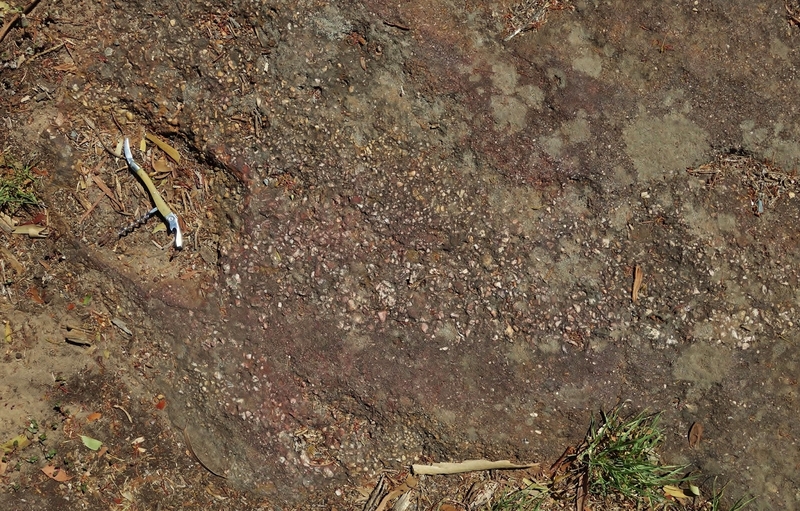 It's seven years old, but tiny, because it grows in just a few centimetres of recent wind-blown sand over solid slab ironstone. This little dude is destined to become one of the rare Old Vines of the future. Bush vines. No trellis. 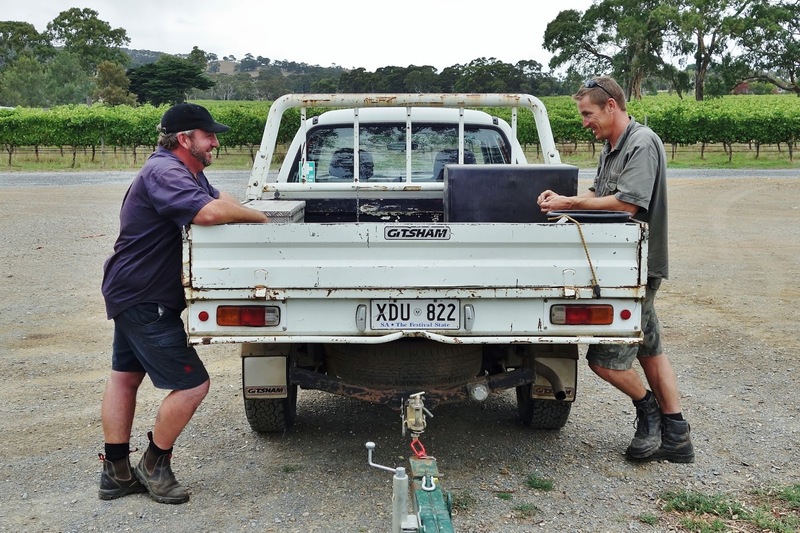 They're a lot more labour-intensive to grow without the modern petrochem sprays, and take a lot longer to mature, but they're tougher and their fruit is more intensely-flavoured. They make much better, more valuable wine. There's a whole army of these little battlers there, all producing one or two utterly delicious bunches each. The pickers handle this fruit like diamonds. 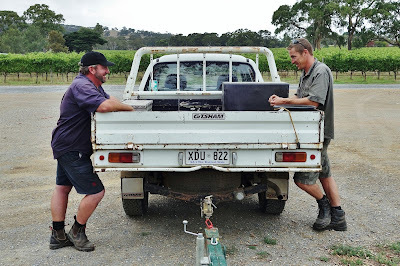 They'll produce more bunches when they get themselves established, and their wines will be, well, worth the wait. They already rock. Speaking of which, the ironstone of the Blewett Springs valleys and Yangarra, in the north-eastern corner of the McLaren Vale vignoble, is generally pebbly and granular on the surface, from buckshot size through grapeshot and then larger. 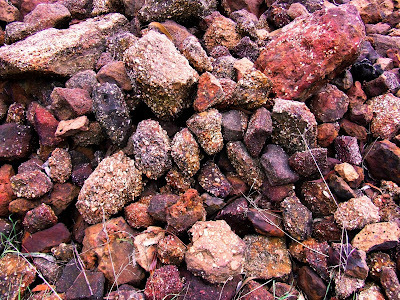 When these various and diverse pebbles set in a sandy matrix through constant washing in ferruginous groundwater and oxidation through exposure to the atmosphere and the sunlight, new conglomerations of rock forms, and you get pretty surface fruitcake gibbers like these, collected in the vineyard. 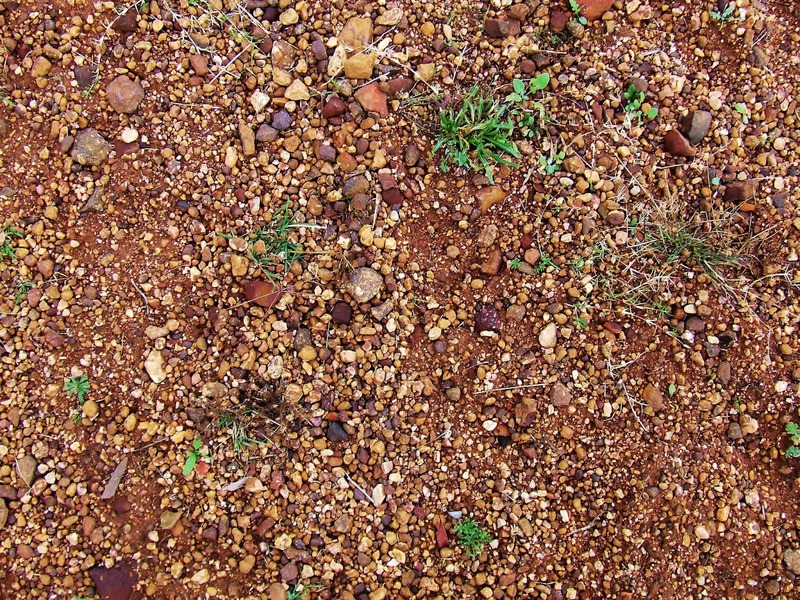 A few centimetres beneath the wind-blown sand and loam of the Ironheart Vineyard, however, the ironstone is massive in the truest sense of the word, and lies thick and deep in great tennis-court-sized slabs, and larger, like uncut terrazzo. 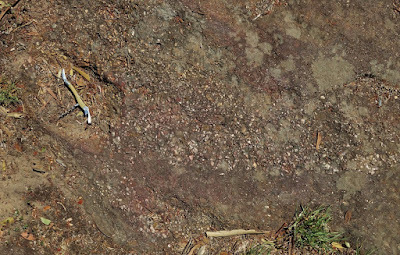 These huge slabs are impenetrable: you can see where the cracks are by the lines of red gums that get their roots through into the more nourishing and moist ground beneath. 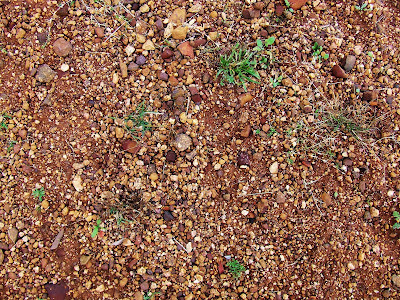 Deep below the entirety of McLaren Vale lies a huge body of coarse red sand, called Maslin Sand, which is not marine. Rather, it's some of the last weathered remnants of the mighty mountain range that formed the Fleurieu Peninsula, the South and North Mount Lofty Ranges and then in the far north, the Flinders. 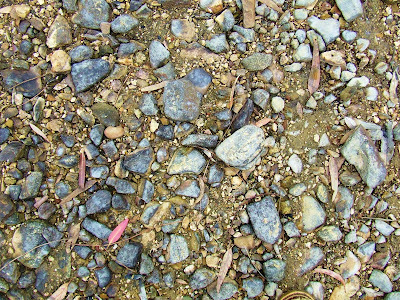 In the Barossa, it's called Rovalley Sand. It is not unique to the Vales. 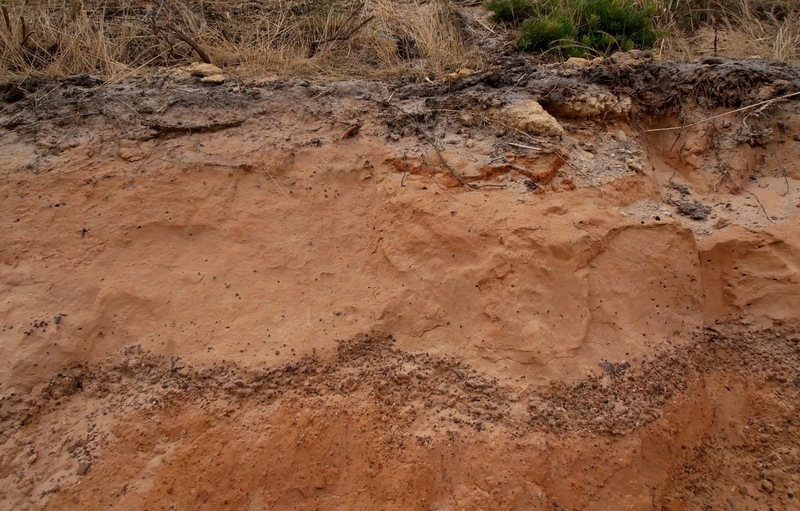 What commonly confuses the issue is these Maslin Sands, whether loose or oxidised and therefore converted to ironstone, are overlain by wind-blown, or æolian sand, which has been laid down in various depths on top of the Maslin formation in the last few thousand years. Here you can see a profile of this loose, recent æolian sand in a cut at the back of Tim Geddes' winery at the southern end of the Blewett Springs gully. 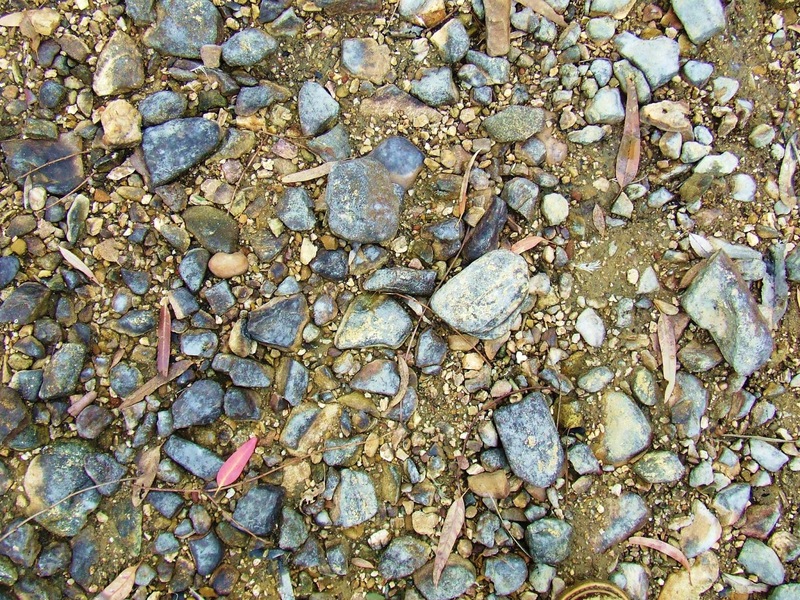 The intermediate layer of grapeshot and buckshot-sized ironstone pebbles was washed into place when that was the surface, before the top layer of paler sand was blown in. The more ferruginous sand below, clayed-up and probably stained by that iron, is also wind-blown, or æolian. Well below that you'll hit solid slab ironstone atop looser Maslin sand. Here be flavour. Drink up.